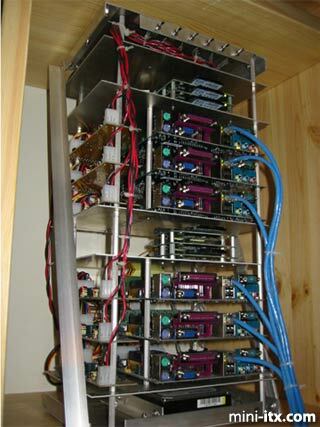 The top rack houses nodes one through six (node one is the controlling node). The bottom plate of the top rack also houses the 160 GB ATA-133 hard disk drive used by the controlling node. All other nodes make use of the IBM microdrives. Node number three has a spare compact flash adapter which can be used to duplicate microdrives for easy node maintenance. 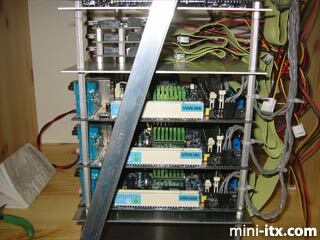 The disk drive and power cabling to the motherboards was dressed as was sanely possible on the back panel. The liberal use of nylon cable ties helps reduce the tendency of pc cabling to develop into a rats-nest. 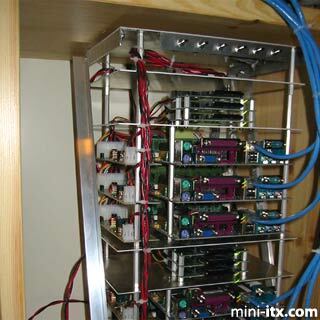 The bottom rack houses nodes seven through 12, with one microdrive for each node mounted in an identical manner to the top rack. Other than lacking a hard drive on the bottom plate, the second rack is identical to the first. All the metalwork is fabricated by hand using 0.0625 inch aluminum plate and 3/4 inch aluminum angle stock. All of the standoffs and metal bits are attached using stainless steel 4-40 machine screws and aircraft style locknuts. Stick-on rubber feet keep the bottom plate from marring delicate surfaces. There was no cutting or bending involved. All metal bits were simply cut, drilled, and bolted together using 4-40 hardware. 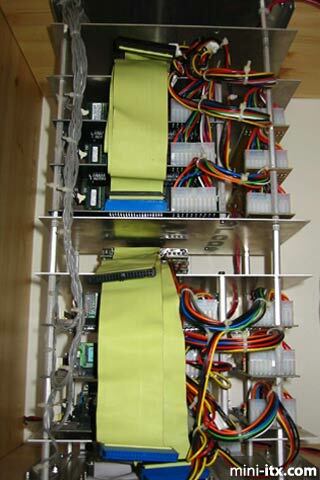 All wiring is crimped by hand using standard crimp connectors and tools available from a popular online electronics components supplier. The hand made wiring harnesses are dressed by twisting the wires to assure low noise, and then fixing the wiring in place using nylon cable ties. The power/reset switches are on-off-on center off , three position momentary contact toggle switches available from most good electronics supply stores. The wiring for these switches is hand soldered at the switch end, and standard 0.1 inch header connectors were crimped at the motherboard end to make the necessary connections. There is nothing sacred about the networking. 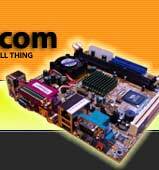 I used the internal fast ethernet adapters which came with my mini-itx boards. 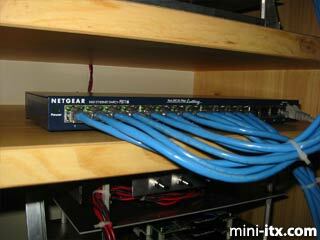 The network switch was a low cost 16 port fast ethernet switch purchased at an office supply store for about $80. The cabling was crimped by hand using good quality four twisted pair (8 conductor) cat 5 cable. The DC-DC converters require a clean, well-regulated 12VDC source. 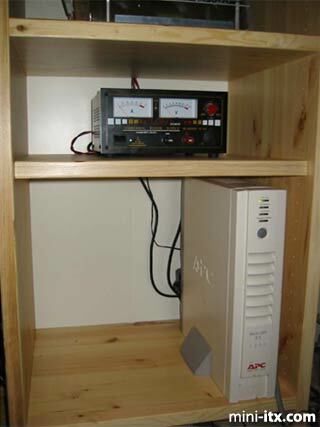 I chose to use a heavy duty 60 ampere 12VDC switching power supply capable of delivering 60 amperes peak current which I ordered from an online electronics test equipment supplier. Since badly conditioned AC power is potentially damaging to expensive computing equipment, I use a 1 KVA UPS purchased at an office supply store to make sure the cluster can't be "bumped off" by power line glitches and droputs.